Now you might be thinking the same thing I was. How can someone possibly have enough time to stretch themselves, the horse and groom and ride and do barn chores and…? Yes, some details started to get left out, but some started to combine! Is it time to pick the horse’s hoof out? Why not throw in a forward bend? That makes four forward bends if you do it for each hoof. How about brushing the legs? Why not side lunge to the front, then to the back. That’s two of each when you go to each side of the horse. Girth all done up? Now it is time to stretch the horse’s leg forward. It’s a stretch in addition to smoothing the skin under the girth area. Your horse deserves a treat? Make them stretch their neck and head to each side to reach it, or down to their chest or between their front legs before you give the treat to them. Not only do they stretch, but they learn not to pester for treats. They don’t get the treat directly from the pocket. After coaxing my horse with treats to teach him to bow he now will automatically start to bow when he knows I have a treat. People saw what I was doing and wanted to learn. With the encouragement and support of a wonderful Master Coach, Linda-Ann Bowling, I started to teach what I love. I combine fundamental yoga postures with fundamental horse stretches, which all together provide a fabulous whole body stretch and balance. Depending on the horse and human participant some of the yoga poses can be combined, and some alternate between the human doing their pose and then helping the horse do their pose. 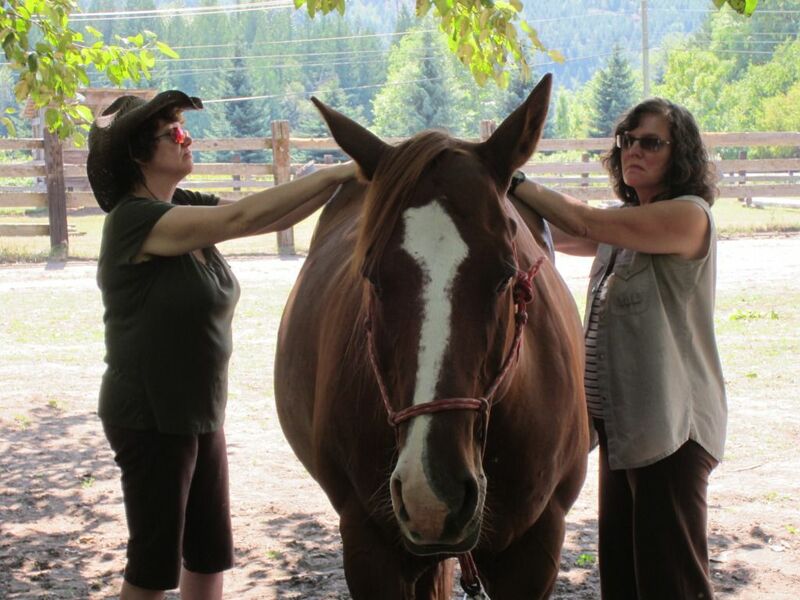 Some poses use the horse for support or for a visual aid for the experience. 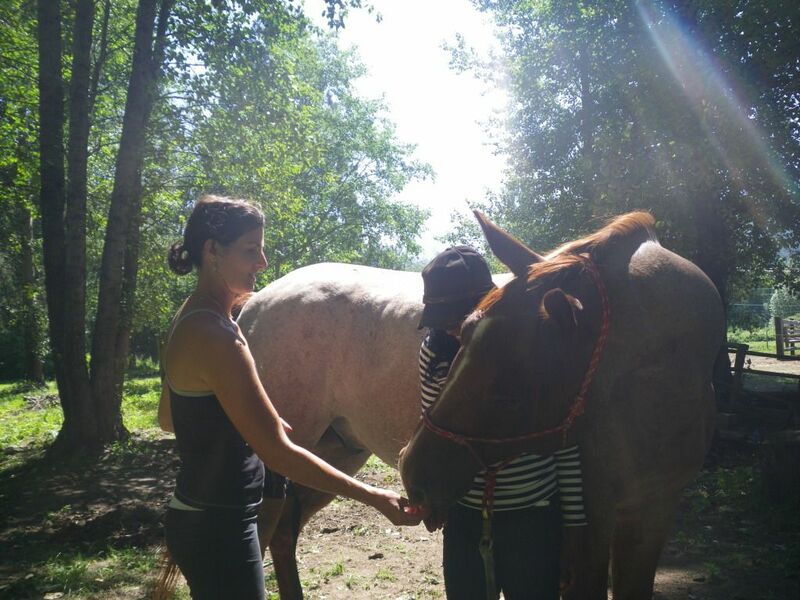 The horses almost always join in on the experience before we even ask them to. As the humans start their yoga I have seen the horses stretch their own legs out, arch and stretch their backs, or go for a roll. During one session one of the horses leaned right back into a downward dog and held it while we all stared in awe. I had shown horses how to do that stretch but had never seen one do it freely on their own! Just the presence of a horse can sometimes take a human to a different level in their yoga. I guide humans through chair yoga sessions where a horse is present, loose to wander in the enclosed area. The horse’s reaction to us and what we are doing is always interesting. It can become quite a spiritual experience. Yoga in a chair helps people understand that yoga can be done anywhere. We can incorporate it into our lives easier then we might have thought. Wouldn’t that be nice for our health? For horse owners they can take that chair yoga into the saddle and have some fun while seated on their horses (or on a hay bale!). There are different people doing different things with yoga and horses out there. I believe it is all wonderful. If you get a chance give it a try and experience it for yourself….for your sake and the horse’s.